Mike Kotch began his career in public accounting after graduating from Bentley University in Waltham, Massachusetts in 1998. After spending five years as an accountant, he began formulating a desire to explore a new career path. He made the bold decision to follow his passion to get back into college athletics where he became a swim coach. An opportunity came up to become the Assistant Coach position at Bentley University in 2002. Mike Kotch had been a swimmer and baseball player at Bentley, and he was excited to return “home”. He coached at Bentley for six seasons and then was offered the chance to be a head coach for the first time in his career. 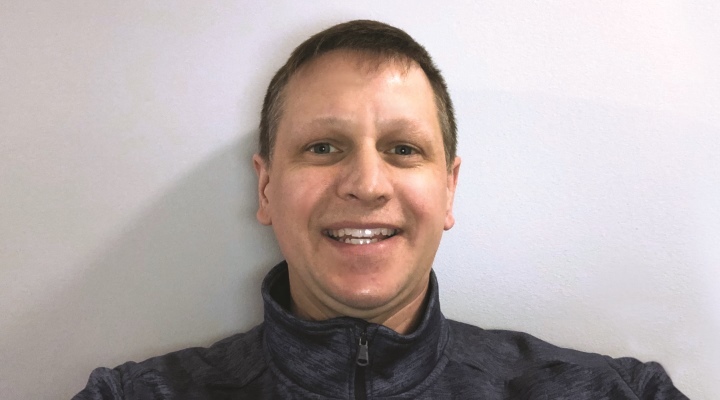 He became the head swim coach and director of aquatics at Regis College, in Weston, Massachusetts in 2008 where he stayed for three seasons until Mike Kotch was awarded the head coaching position at Brandeis University in Waltham, Massachusetts. Mike coached at Brandeis through the 2018 season where he helped his swimmers earn countless lifetime best swims, university records and supported them on their way to amazing post graduate opportunities. Situated in Ashland, Massachusetts, Mike Kotch is the proud father of two young daughters, Taylor and April. Mike has decided to rebalance his professional life so that he can put his children first and do things that were not possible to do while Mike was pursuing his coaching career. The first task this winter is to give his girls the chance to learn to ski. This was nearly impossible to schedule when he was away winter after winter coaching. How did you get started as a coach? What inspired you to switch from accounting? What inspired me about sports, even before coaching, was that I really just loved the interaction with other student-athletes. Once I started coaching, I never really knew how a practice was going to unfold and I somehow found that exciting. While I really enjoyed my fellow accountants and clients, I started to discover that something was missing among the debits and the credits and the tax returns. It had a bit of a Groundhog Day feel. When I had the opportunity to work as a coach, I really enjoyed the opportunity to have a positive impact on people. What do you find most challenging as a coach? It is quite a challenge to figure out how to get 40 to 50 student-athletes to move forward with some common team goals, yet have them understand that it is okay to be moving towards these team goals in a manner that might be very different from another member of the team. I guess it’s a “do your job” (thanks Patriots!) mentality while having faith that everyone else is too. It takes a lot of positive thinking! What do you most enjoy about coaching? The most enjoyable part of coaching is seeing a student-athlete become successful. That success might be a university record or a personal best time, but I enjoy trying to help each swimmer develop a fulfilling definition of success for themselves. There’s nothing better than that goosebump moment at the end of a race when they look at the scoreboard and then smile as big as they have allowed themselves to over the course of a six month season. Absolutely! Fortunately, my first coaching job was working with the coach who trained me as a swimmer. I was very fortunate to have her as a mentor. I was amazed at how she was able to navigate through every situation. I often wondered if I would be able to address an issue as well as she had. I think one of the things she did best, and continues to do, is that she keeps it positive and simple. Sometimes overwhelmingly simple to me as I like to think about things from every possible angle. What do you think makes you successful as a coach? I just try to be sure I am always doing the right thing. I know enough about myself at this point in my life that my conscience is a great leader and I have no problem changing my mind or admitting a mistake if I can’t sleep at night. It is hard sometimes for a student-athlete to see the forest through the trees, especially if it involves discipline, but life lessons have always been something that I have felt are important to teach. I consider myself to be a successful coach if I can help a student-athlete connect the dots much sooner rather than later. I try to embed light-bulb moments for them. It might not happen for ten years, but I know they happen because they happen, and still happen to me. What has been your most satisfying moment since you began coaching? For me, it’s at the end of the journey when you see a senior standing on the deck during the senior recognition night in their final meet. Seeing how they’ve grown, matured, learned to appreciate things. That’s what I find satisfying. It really has little to do with swimming. There’s a lot of ups and downs along the way, but to see them standing up on that night I usually always know they have worked to be better teammates and learned to be better people. As for the swimming….the times they put up in their final swims are usually always the best ones of their careers! Right now, I am most excited about being able to play a more prominent role in my own children’s lives. While I don’t begrudge it, I have tried to be the best coach and mentor for other people’s children over the last 16 years and fortunately, I had a light bulb moment. It’s time to watch my own kids grow up and to be more actively involved in shaping them. What books inspired you that you would recommend? I have read countless leadership books over the years. Anything that I could try and pull something out of to pass on to a swimmer about confidence, leadership, self-esteem. Those are books I have been drawn to over the years because I think they helped me be a more effective coach. Now, I love reading whatever my kids are reading and I recommend every parent continue to keep, or make, bedtime reading a part of their routine. Are there thoughts about being a coach that you would like to add? I consider myself lucky that I have always found myself surrounded by good and positive people. I have had great mentors and advisers as well as people that I trust and respect. I don’t know why, but I appreciate that they take an interest in me, my family, and my career. I cannot thank them enough as I am a little bit of them in many of the things I do!